Welcome, Germantown, a yarn that reaches back through the history of US crafting to the early 1800s, when the name “Germantown” referred not to a specific brand of yarn but simply to good-quality worsted-spun wool from Germantown, Pennsylvania. As reimagined by Kelbourne’s Courtney Kelley, today’s Germantown remains 100 percent North American sourced, spun, and manufactured, a product that harkens back to US industrial and agricultural history. The Building Blocks Collection thus features only three patterns, Scarves, Hats, and Mittens. Each of these patterns includes three possibilities--three designs that increase in order of difficulty--and each breaks down the basic techniques involved in the knitting, offering tips and insights and links to Kelbourne’s exceptionally clear photo tutorials. “Scarves” takes the knitter from simple garter stitch, through a sporty ribbed stripe, to cables. “Hats” moves from a rolled brim, to a ribbed brim, to an allover ribbed hat, simultaneously serving as a blank canvas for adding stitch patterns or colorwork. “Mittens” offers basic stockinette, broken ribbing, and stranded colorwork. 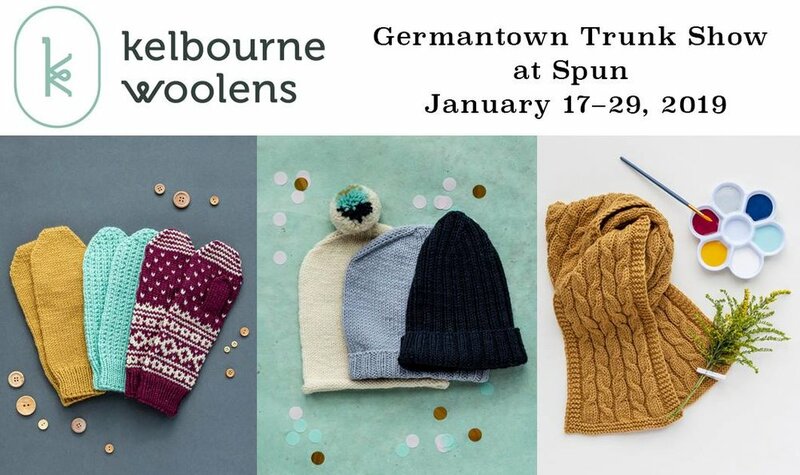 Celebrate our crafting past while you refresh your cold-weather future with Germantown!